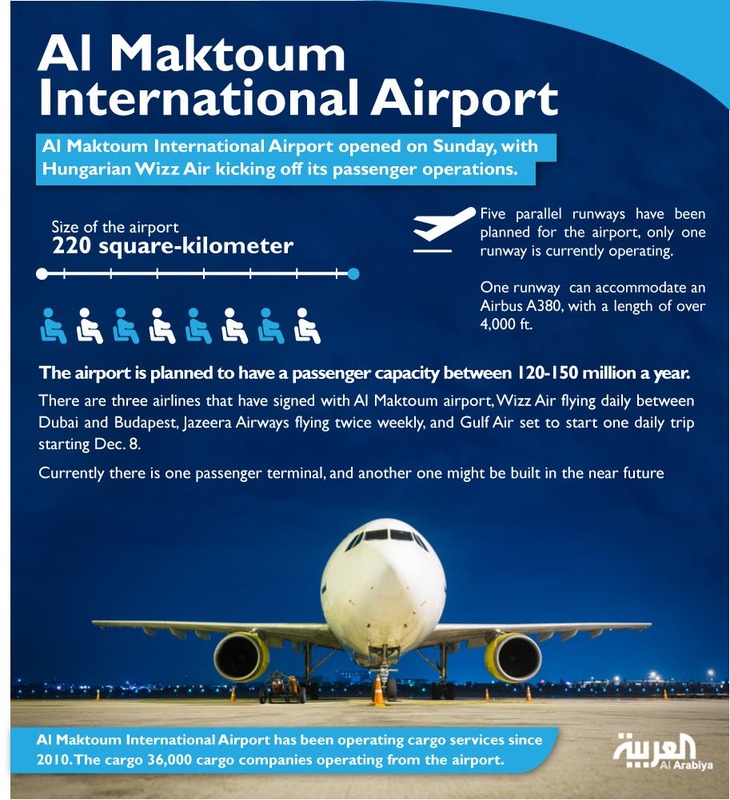 Dubai’s al-Maktoum International Airport began on Sunday commercial passenger services with a plan to become the world’s busiest airport by 2020. 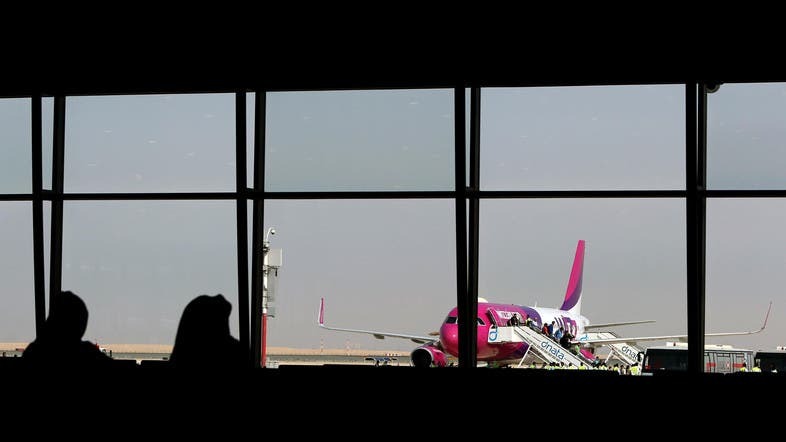 Hungary’s low-cost carrier, Wizz Air, began operating flight at the airport, which upon completion will consist of five runways, with a capacity for 160 million passengers and 12 million tons per year. Despite containing the world’s largest terminal, major carriers such as Dubai’s flagship carrier Emirates Airlines are not rushing for a spot at the new airport, located at Dubai World Central on the city’s outskirts. An Emirates spokesperson told Al Arabiya News that the carrier’s current base at Dubai International Airport is “sufficient for our immediate needs,” and can accommodate its growth for the next 12 years. However, the airline – owned by the emirate’s government – plans to make the shift to al-Maktoum International Airport between 2022 and 2030. On the other hand, foreign carriers have expressed a more immediate interest in the new airport. 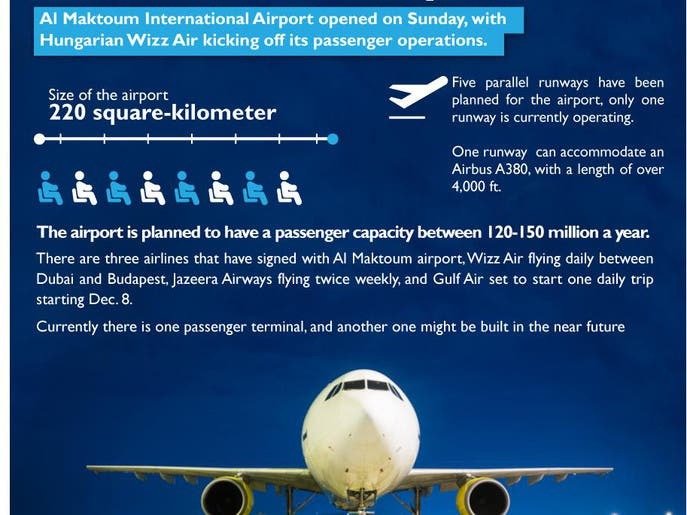 In addition to Wizz Air, Kuwait’s Jazeera Airways, another low-fare airline, will begin operations at the airport starting on Oct. 31. Bahrain’s main carrier, Gulf Air, is set to begin operations on Dec. 8, according to an airport official. The 220 square-kilometer airport has been handling cargo flights since 2010, but received the green light from the General Aviation Authority to open for passenger-carrying flights last September. “DWC is Dubai’s airport of the future and a fundamental element of our master plan, which is being designed to accommodate the tremendous passenger growth being projected until 2040 and beyond,” Dubai Airports chief executive officer Paul Griffiths said in a recent statement to Khaleej Times. “Dubai overall has been a success story in aviation terms with airport and airlines, in the case of Emirates of course, for some time, not only in the region, but globally,” John Strickland, a UK-based airline industry analyst with aviation consultancy JLS Consulting told Al Arabiya News last month. However this success story would only continue if “projected aviation growth [continues],” David Bentley, head of UK-based consultancy Big Pond Aviation told Al Arabiya News in the same month.